I have been cleared for all activity without restrictions. I am now playing singles tennis without holding back. I am out of shape (for 95 degree singles tennis), and still feel not as flexible or as strong, but have had no pain even after 2 hours of drills and playing. The hardest thing I find doing is bending and staying down, but I have been standing straight for over 10 years. I expect to continue improving as I keep pushing myself. 3/4/2014: I am a 57 year old physician who had a left hip BHR performed by Dr. Raterman on 2/19/2014. I have been posting my pre- and post-surgical thoughts on youtube ( https://www.youtube.com/channel/UCYWv7uE53NUtshlWk20lq4Q/playlists ) for those that are interested. The following is a detailed diary of my recent BHR hip resurfacing with Dr. Stephan Raterman in Tampa FL. I recorded my progress from surgery day to 16 days post op. I am a 45 year old man and received a right BHR after suffering from OA in my right hip for 7 years. My name is Rick Foster and I’ve been researching hip replacement and in particular resurfacing for well over 3 years. I have found your Surface Hippy website to be one of, if not the best overall source of information out there! I am two weeks post op with Dr. Raterman. I live in New Mexico and traveled to Tampa for surgery and am certainly glad that I did. Dr. Raterman has now done more than 270 procedures. He did a resurfacing on my right hip and I will return to Tampa in March for resurfacing of the left hip. Resurfacing is one of his favorite things to do and he has a really good team that he works with all the time. I went into the hospital on Tuesday and was discharged on Thursday. I stayed in a hotel for 5 more days and they set it up for the physical therapist, who was excellent, to come to me at the hotel. Like many Americans in their 50’s, I suffer from various forms of osteoarthritis. For the past two years, the arthritis pain in my right hip gradually increased. 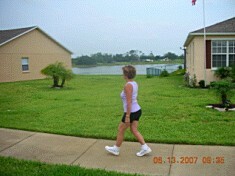 One day in January 2007, I woke up in the morning and stepped out of bed placing my normal weight on my right leg. A sharp pain shot from my right foot to my hip, and I sat back down quickly. I’m a 51 year-old firefighter who is 3 weeks post op from having my left hip resurfaced by Dr Raterman out of Tampa. Dr Raterman resurfaced my right hip 4 years ago and I’ve had great results ever since doing that surgery. Walking without a cane now and riding my bike twice a day in the neighborhood. I just past my one month mark having my right hip done (I’m a 49 year old fairly fit male, singles tennis player), and am amazed at the entire process I went through. Dr. Stephen Raterman in Tampa, FL performed my surgery at Florida Hospital at Wesley Chapel. I had an absolutely amazing experience with both Dr. Raterman and his staff and Florida Hospital. Truly world class, compassionate, professional medical treatment from Florida Hospital and Dr. Raterman’s team, it was well worth the 5 hour drive I did to go to their facility. Feb,22 2013 will be my 1 year postop. So far so good. Work as a firefighter and playing ice hockey twice week in Fort Myers, Florida.. My right resurfaced hip (Dr Raterman,Tampa) does not give me any issues whatsoever. May have to get left one done in another year or so but holding out until I have to. Went back to work full duty as a firefighter in Fort Myers Florida at 8 1/2 weeks. 1 year post op now and resurfaced hip feels great. I live in North Cental FL. 1st hip resurf 11-10-06 at age 59 by Dr Kennedy in Sarrasota. Love that man, but he’s retired from surgery. 3 1/2 years out from my bilateral BHR hip resurfacing with Dr. Raterman. I’m from the Tampa area and Dr. Stephen Raterman has done both of my hips. weight bearing from day one. I am having a problem straightening my right knee without forcing the issue. My in home physical therapist has given me instructions to continually try to straighten the leg at the knee when walking and when sitting but it leads to knee soreness and pain. I had Dr. Stephen Raterman in Tampa, Florida as my surgeon about 8 weeks ago. When I checked this site before surgery, I didn’t see any good (no offense intended if I missed it) info on him, so now that I’m 2 months out & feeling pretty great, I think it’s time for me to post my opinion here. I highly recommend Dr. Raterman for hip resurfacing surgery. I had an auto accident in Dec 1994 and ended up with a broken femur on both legs. They did a IM nailing on both legs. I have been playing tennis since 1995 till now and play 3-4 times a week. In Jan 2009, I started developing pain in right hip area and I found out that I had a osteo arthritic condition (could be due to trauma from before) and it was literally bone on bone. I took my time to decide on surgery date and continued to play tennis with taking Advil after the games.